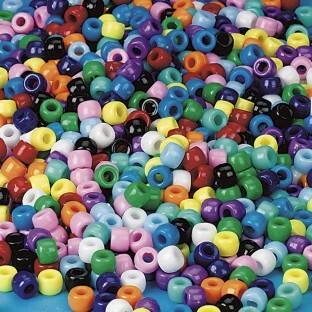 Color Splash!® high-quality plastic pony beads with large 3.5 mm holes for easy stringing. Available in 18 of our most popular colors. Consistent size makes these good filler beads. Approximately 850 beads per bag in 6 x 9mm size. Please specify color when ordering. The kids love using these bright colored beads to create all types of projects. They especially love making animals to hang off their backpacks. The children love this item!!! I help run a children's drop off program at the resort I work for. The kids that come to stay in our care LOVE making necklaces and bracelets with these beads!! It is one of their favorite things to do and they always come back requesting to make more for mom or dad! A great quick craft that keeps them entertained! Perfect size for preschool hands. Every summerI volnteer in a poor Maasai village in Tanzania and I always order materials from SS. I often have 50 children all ages to amuse and with nonexistent materials there. But beads and elastic thread are extremely popular and boys and girls alike make bracelets and necklaces galore. I reorder beads every year. summer camp here we come! we make a lot of name bracelets at summer camp love these pony beads.